BJP may be relying hard on Vivek Oberoi to campaign for them and Congress is backing Urmila Matondkar to get a set for them in Mumbai. CPI (M) is also not holding back when it comes to star campaigners, with Swara Bhasker coming out for one of their political rallies. However, Swara's support may be less for the party and more for the man they are fielding from one of their constituencies - Kanhaiya Kumar. Sanjay Raut Gets Election Commission's Notice For Saamna Editorial Saying: 'Rig EVMs, But Defeat Kanhaiya Kumar in Begusarai'. 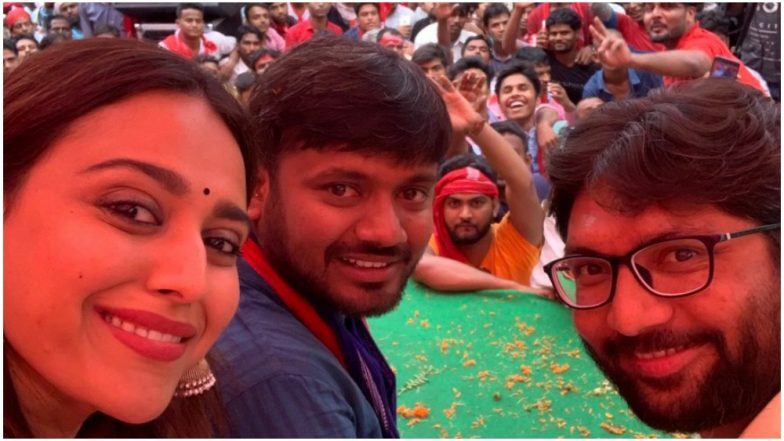 Swara Bhasker, who celebrated her birthday on April 9, spent the day campaigning for her friend, Kanhaiya in Begusarai, Bihar. Swara and Kanhaiya both share a common trait of being some of the biggest critics of the current government, led by BJP's Narendra Modi, and have been quite vocal about it on their social media accounts. Swara recently posted a video clip of their rally, where she is heard talking in support for Kanhaiya. In the video, Swara lists off the important things that voters should think before casting their votes, like food, education, employment and medical facilities. And ends the speech by hailing Kanhaiya Kumar, calling him 'Jiya ho Bihar ke Lala'. She ends her speech with the slogan, 'Jai Hind! Jai Bheem! Lal salaam!' Also seen in the clip is Jignesh Mevani, Kanhaiya's close associate and Independent MLA from Vadgam, Gujarat. Kanhaiya Kumar, who is a former Jawaharlal Nehru University union leader, is contesting against BJP's Giriraj Singh. Lok Sabha Elections 2019: Kanhaiya Kumar Named as CPI Candidate From Begusarai, Day After Mahagathbandhan Left Him Out. Speaking to IANS, Swara had spoken about why people should vote for Kanhaiya. She had said, "Kanhaiya raises issues that concern all Indians...issues like the threat to the Constitutional values and to the Constitution of India, unemployment, the rise of mob violence, the need for social justice and the need to focus on issues that will better the lives of all Indians. I think as responsible and patriotic Indians we should all feel aligned to this ideology/or thought process." Let's see if Swara's earnest campaigning helps Kanhaiya in the 2019 Lok Sabha Elections.